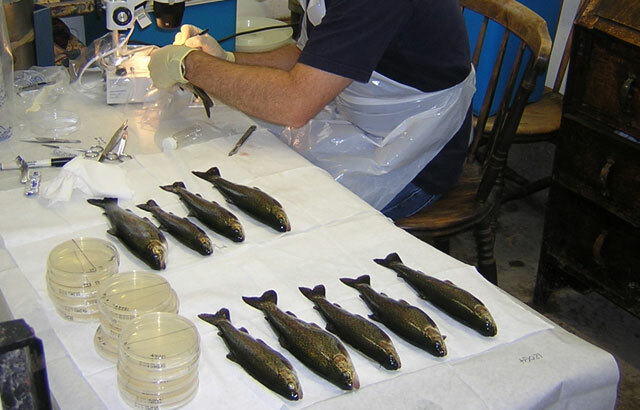 Samples of UK trout and salmon are analysed for residues of veterinary medicines and unauthorised substances under the Statutory Surveillance Programme. These samples are taken by the Fish Health Inspectorate at Cefas. During 2012 only four samples were found to contain residues out of a total of 1,652 samples taken. Two had residues of very low levels of polychlorinated biphenyls (PCBs), which were found to be below the proposed revised European Food Safety Authority maximum residue limit. The other two samples both contained emmamectin and the investigations established that in one case the fish were within the withdrawal period at the time of sampling. In the other case the dosage of the veterinary product had been exceeded. During 2013 only one sample out of 1,490 samples was found to contain residues of Leucomalachite Green. The investigation established that the cause of the residue was due to the disturbance of silt in the ponds due to adverse weather conditions. For updates please sign up to email alerts from this blog, email me or you can follow us on Twitter @CefasGovUK.